For most teenagers, comfort food would be a bite of sandwich or a bowl of Biryani. Yes, Fast foods are indeed the most comforting snack! Be it the roadside butter loaded pav bhaji, deep-fried vadapav or a plate of dahi puri, everybody crave such food once in a while. These are foods that are so tasty that they can easily cause the tethers of self-control to snap! Some days are happy while some are dull – why not have snacks that matches your day, or rather balances it, so that at the end of the day you feel nothing but happy and contented? That is why we have put together this collection of snack recipes that will appeal to both young and old. Chaats like dahi vada, sev puri with an amalgam of vadas, puri with peppy chutneys, spices and a sprinkle of sev or coriander are sure to lighten up your mood after a long day. They are an outburst of flavor and highly customizable! Dosa or Idli combined with a range of chutneys, dry chutney powders and sambhar, makes a sumptuous grand meal. Another crispy dosa that requires no fermenting is the famous Onion Rava Dosa. It can be whipped up in a jiffy with just a handful of easily available ingredients. Bread or pav is that one food, which does not require many accompaniments to savour. Just a spread of butter/chutney or jam on a toasted bread slice can make up for a delightful breakfast. You can even make various sandwiches by stuffing an assortment of vegetables or stuffing between the bread slices. Also, delicacies like misal pav, pav bhaji, bhajji pav are incomplete without laddi pav. How can you forget Vada Pav - the poor man’s burger! Serve with fried green chillies if you like stuff a tad spicier, and perk it up further by adding finely chopped onions along with the chutneys. 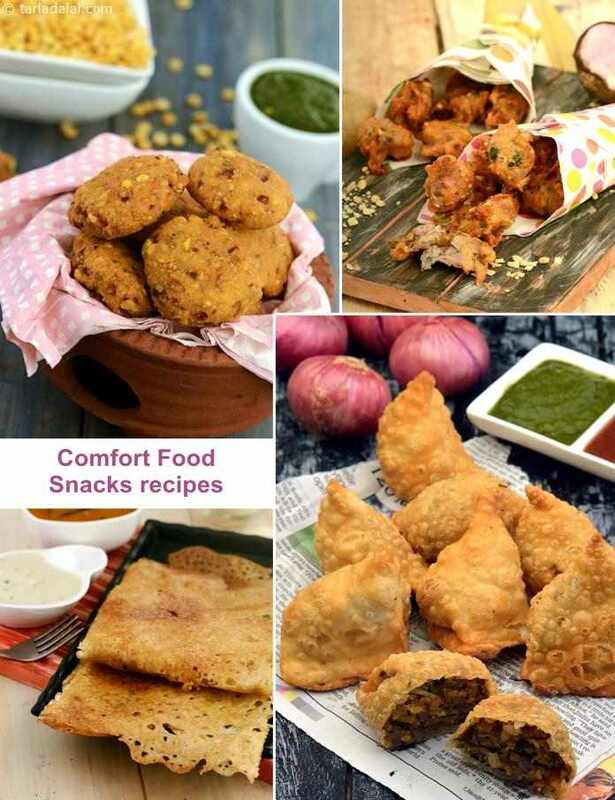 Enjoy our collection of Comfort Food Snack Recipes and other Comfort Foods Recipes articles below.